Police officers ask a journalist, lower right, to leave as he covers people gathering in front of a McDonald's restaurant which was a planned protest site in Beijing, February 20, 2011. China has increased the presence of security forces around the country in response to an on-line call for nationwide demonstrations in solidarity with the so-called "Jasmine Revolutions" in the Middle East. An online posting on the Internet called for demonstrations around the country Sunday, to mark what it called "China’s Jasmine Revolution." The appeal went out to all Chinese who feel there is injustice in the country -- including parents whose children suffered from tainted milk, people who feel their homes were unjustly torn down, and people who are upset at the abuse of official privilege. The appeal urged people to go to designated locations in cities around the country, watch the developments and, if brave enough, shout out demands. 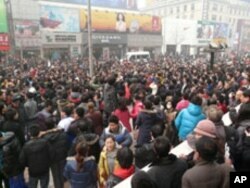 In Beijing Sunday, a few hundred people gathered quietly in front of a fast food restaurant near Tiananmen Square in the center of the city. The only real noise from the demonstration was uniformed police officers moving through the crowd to try to disperse people. Eyewitnesses say the demonstrators did not chant slogans nor display banners, and did not talk to journalists at the scene. Prior to Sunday’s gathering, authorities detained a number of activists, including prominent human rights lawyers. Internet activist Tian Tian says she saw an unmarked car drive away with lawyer Xu Zhiyong early Sunday morning, when she went to the Beijing home of Teng Biao, another lawyer who also had been taken away. She says she believes the detentions have to do with Sunday’s demonstrations, because authorities asked activists what their plans are for Sunday and urged them not to go out. Meanwhile, the demonstrations in China were making their mark on the Internet social network, Twitter, where a hashtag set up for that topic received one thousand messages a minute by Sunday evening. Many tweets about the Beijing demonstration agreed there were "lots of people," but that it was hard to tell who among them were actually protesters. One tweet implied that nothing happened and joked that everyone should just go home because the crowd was all made up of plain clothes police.